--- It feels impossible to even put up a blog post today, without acknowledging the horrific news of yesterday, a very dark day. Sympathies (...despite what little potency they have) to any/all directly affected by the tragedies... NOT proud to be part of the human race today. A peaceful, contemplative weekend to all... somehow. "Mathematics as currently practiced is a delicate interplay between monastic contemplation and blowing stuff up with dynamite." -- Jordan Ellenberg in "How Not To Be Wrong"
"He’s really somewhere between a mathematician and a stand-up comedian, and to be honest I don’t know which one he’s better at, although he is a deeply talented mathematician." I feel like I'm the last person on the planet to interview Jordan Ellenberg :-( so busy has he been since his book, "How Not To Be Wrong" appeared (...but better last, than never!). As a fan of his Web writing I'd requested an interview months before his book was released, and, luckily since most of my questions don't pertain specifically to the book, they still have at least some freshness, despite his recent whirlwind tour and almost over-exposure! 1) To start, can you tell readers how your interest in math began, and when you knew you wanted to pursue it professionally? I was interested in math from the time I was a very small child. (I think there’s a prevailing stereotype that all mathematicians show a special interest in math very early, but that really doesn’t seem to be the case.) I always thought I was going to be a mathematician, but I tried other things. Whenever I wasn’t doing math, I found I missed math. Having this knowledge was very useful! 2) You have a book out… tell us what it's all about, and do you foresee more books in the future (you also wrote a novel about a decade ago; any more fiction in your future, as well)? The book is called "How Not To Be Wrong" and it makes the case that mathematical thinking is naturally woven into all of our thinking. We shouldn’t think of it as an alien habit we have to acquire, but a pre-installed part of our cognitive toolkit, which everybody can get better at using. I hope a lot of people who don’t ordinarily buy math books will read it — but I think it has a lot to offer to people who know a lot of math as well! I certainly learned a lot writing it. 3) From what I've read, you were a child prodigy… how difficult was it growing up, being so far ahead of your own peer group, and do you have siblings that were similarly gifted? 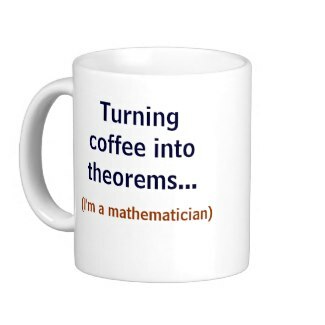 …also, any other mathematicians in the family? I know lots of people who found it very difficult to be academically advanced as a kid. I didn’t. I didn’t find that being many grade levels ahead in math made it harder for me to relate socially to other children, and I never had any desire to leave school and go to college early. In fact, I used to think it was a bad idea to do that; but now, as an adult, I know lots of people who started college very young and are glad they did. My parents are both statisticians, which made things easier; they knew very well what I needed to learn and where the resources were for learning those things. 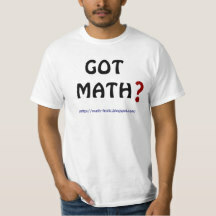 4) Up to this point in your life what math-related achievements are you most proud of? You’re always proudest of the things that push you to learn new things and acquire new skills. I have two big interdisciplinary projects going on, with a bunch of collaborators, a project in “stable topology” and a project in “FI-modules” — both mix number theory (my main specialty) with other subjects that I’ve had to learn a lot about as I go. I tend to be more attracted to projects that involve things I don’t know how to do. The book itself is like that; I’ve done a lot of popular writing but I didn’t know what would happen when I tried to do it at length. And I’m pleased with the results! 5) Your math blog is titled "Quomodocumque" -- if you're not too sick of answering this question ;-), want to tell readers where that title comes from and why you chose it? It means “in whatever fashion” and is meant to suggest a sort of eclecticism. I went to a history-of-math talk that I didn’t understand at all, but at some point there was a slide of a Latin mathematical manuscript, which contained that word, and I said to myself, well, even if I get nothing else out of this talk, that’s a hell of a word. 6) What have been some of your favorite posts over the time you've been blogging… either your own personal favorites, or ones that generated a lot of reader interest? Thanks to counter stats I know exactly what people like to read and what they don’t. Nobody cares about the Orioles. Lots of people like math posts, including technical math posts. Posts about politics and controversies within the profession are by far the most popular: hiring practices, women in math, professional ethics, etc. 7) What are your favorite digital resources for assisting in teaching mathematics? People love to make fun of it, but Wikipedia is an immensely valuable resource for mathematics. I assume all the math pages are written by procrastinating graduate students. They’re very good. Of course, the more technically minded blogs, especially Terry Tao’s, do a huge amount of work at the research level, spreading news not only about new theorems but about new ideas, techniques, and strategies. MathOverflow is wonderful for people who already know enough to ask and answer questions there. 8) You write for Slate and various other media outlets… if someone isn't familiar with your writing, can you point to 2-3 (Web-accessible) pieces that are a good introduction to your writing? Here’s a recent piece from the Wall Street Journal, drawn in part from the book, where I talk more than there’s room for here about the idea of genius as applied to Ramanujan, Hilbert, Minkowski, and football. This old piece from the Believer, a joint review of books about the Riemann hypothesis and books about mountain climbing, is probably my favorite of the magazine pieces I’ve written. The crazy idea of the piece is entirely due to my editor, Heidi Julavits, who somehow knew it would work. This one’s not about math at all, but about my son and baseball. Thanks for the responses Dr. Ellenberg! Jordan has been all over the place of late, both physically and in cyberspace, so I won't attempt to give all those links here, but Google him if the links above make you thirsty for more! And by all means buy his book -- I'm not exaggerating when I say it is one of the best pieces of mathematical writing (for a general audience) I've ever seen... amazing for a first-time effort. As I recently wrote, it made my heart feel good to walk inside a bookstore and see TWO attractive MATH books (Jordan's and Alex Bellos') sitting right up front on the bestseller table greeting people's eyes (and hopefully, with high Hawking Index scores! -- see this Ellenberg WSJ piece). "The cases of great mathematicians with mental illness have enormous resonance for modern pop writers and filmmakers. This has to do mostly with the writers'/directors' own prejudices and receptivities, which in turn are functions of what you could call our era's particular archetypal template…. "Chesterton above is wrong in one respect. Or at least imprecise. The danger he's trying to name is not logic. Logic is just a method, and methods can't unhinge people. What Chesterton's really trying to talk about is one of logic's main characteristics -- and mathematics'. Abstractness. Abstraction." I've lately been re-reading parts of David Foster Wallace's "Everything and More: A Compact History of Infinity." He spent much of his childhood in Champaign/Urbana, Illinois, very near my own hometown, and died tragically in 2008 while teaching at my alma mater, Pomona College, in Claremont, California. In-between, his brain seemed to gallop effortlessly all over the place. Of course it's not his widely-acclaimed, award-winning fiction that interests me; it's his, slightly-lesser-known, non-fiction. That a person of the humanities with an English degree, who poured himself into long, involved, complex novels and wordplay, was capable of also writing about deep mathematics is fascinating. It's a little less strange given that Wallace did deeply study philosophy, logic, and mathematics at the college level... but still amazing to me that "Everything and More" could be born in the same mind that authored "Infinite Jest"(…interesting that "infinite" makes its way into this title as well). 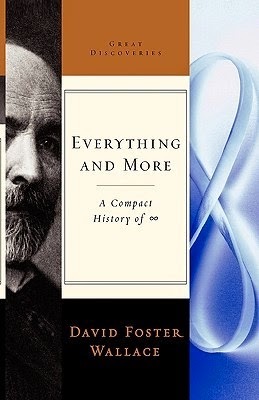 Wallace called his 300+ page volume ("Everything and More") on infinity a "booklet," and he no doubt genuinely considered it but an introduction to the whole subject; scratching the surface of a topic that so often baffles undergraduates, even leading to incredulity or heated arguments, amongst young math majors. Yet the book is a meticulous parsing of the subject as virtually never found in a popular work. In fact, I suspect it falls into that category of 'widely-bought, least-read books ever,' with a large percentage of buyers never completing it; purchasing it solely based on the author's reputation, and then abandoning it after the first 30-50 pages. The book received a number of favorable reviews upon release, but several professional mathematicians also harshly critiqued it, finding it peppered with technical errors… I s'pose that I, as a non-professional, tend to be more forgiving, spellbound as I am by Wallace's ability to even approach these strenuous subjects innovatively… not that that justifies inaccuracies, but just that my joy with the volume stems not simply from the mathematics/philosophy entailed, so much as from the sheer audacity of a renowned novelist crossing boundaries to tackle such matters. I can't even imagine who this book was intended for… surely not the same audience who loved Wallace's fiction; but nor for professional mathematicians who would find faults in it. And not just for me, an audience of one ;-) Somewhere out there must be other "mees," I guess, who stand almost in awe of what Wallace accomplished: the mix of language and math, of thought and meta-thought, of narrative and cerebral-wrestling, while attempting to communicate it all to a mass(?) audience. As I wrote once before, this volume is "written in an informal and conversational tone about ideas that are utterly UN-informal and UN-conversational (...and the multitudinous footnotes are virtually as fascinating as the main text)." "The trouble with college math classes -- which classes consist almost entirely in the rhythmic ingestion and regurgitation of abstract information, and are paced in such a way as to maximize this reciprocal data-flow -- is that their sheer surface-level difficulty can fool us into thinking we really know something when all we really 'know' is abstract formulas and rules for their deployment. Rarely do math classes ever tell us whether a certain formula is truly significant, or why, or where it came from, or what was at stake. There's clearly a difference between being able to use a formula correctly and really knowing how to solve a problem, knowing why a problem is an actual mathematical problem and not just an exercise." This remains one of the quirkiest, both convoluted and semi-profound, volumes on my math bookshelf, from one of the quirkiest, most imaginative minds America has produced. Possibly there is some irony, some stinging irony, that Wallace, a long-time sufferer of depression, died tragically at his own hands, via hanging at the young, fertile age of 46... possibly even suffering mental demons not altogether dissimilar from Georg Cantor, a century earlier; died perhaps an example of the same stereotype or "archetypal template" he points to in the opening passage above ("the closer he came to the answers he sought, the further away they seemed"). One of the endorsement blurbs on the back of my copy of the volume says, "...David Foster Wallace is the perfect parachute buddy for a free fall into the mathematical and metaphysical abyss that is infinity." I think "abyss" may be too strong a word, but I do like the imagery of 'freefalling' into infinity... with an English major no less! This volume won't suit a lot of people's taste, but reading it more as a treatise on human thought/genius and psychology, than a math treatise, I return to it... in wonderment and reflection... each year.